Wyatt Earp has become an icon in American lore, known as the legendary lawman who, with his brothers and Doc Holliday, battled the Clanton gang in the Gunfight at the O.K. Corral in Tombstone, Arizona. Wyatt, a gunslinger and a gambler, also fought criminals in Wichita and Dodge City. 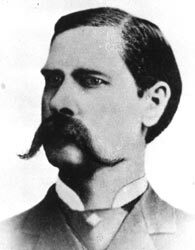 Wyatt Berry Stapp Earp was born in Monmouth, Illinois on March 19, 1848. He was the son of Nicholas Earp and Victoria Ann Cooksey. Wyatt Earp would travel with his brothers, Virgil, Morgan, James and Warren, for much of his life. His older brothers Newton, Virgil and James, fought in the Civil War while the 12-year-old Wyatt and his brother Morgan stayed home with their sisters, according to PBS’ American Experience. Growing up, Wyatt practiced his shooting skills with his dad’s guns. After the war, Nicholas decided to head west. His family moved near San Bernardino, California in 1864, where Wyatt worked on the railroads. He moved back east and got married to Urilla Sutherland in 1870, but the death of his wife from typhoid put him on the move again; he worked as a buffalo hunter and stagecoach driver, where he honed his shooting skills and met his longtime friend Bat Masterson. His police days began in 1875 in Wichita, Kansas. Wyatt then moved to Dodge City, Kansas, after the mayor called for his help in 1876, and worked as a faro card dealer, as well as the town’s assistant marshal. At Dodge City he would become friends with the marksman, gambler stricken with tuberculosis, and former dentist, Doc Holliday. In Dodge City he met his future wife, Celia Anne Blaylock. Then in 1879, he decided to “settle down” with his wife and brothers in the new silver mining boomtown of Tombstone, New Mexico. While in Tombstone, the Earps feuded with a gang headed by Ike Clanton. In October 1880, Virgil Earp became marshal of Tombstone and appointed his brothers Wyatt and Morgan as “special deputies” of the town. The Earps now saw it as their duty to uphold the law in the small mining town of Tombstone. Within a year, the Earp brothers found themselves involved in a number of conflicts. They began to quarrel with Ike, Phineas and Billy Clanton, as well as Tom and Frank McLaury, over suspicion that they were selling stolen livestock in the town. Wyatt Earp also began a feud with John Behan, the sheriff of Cochise County, Arizona, over an actress named Josephine Sarah Marcus. Wyatt and “Josie” would spend more and more time together. Josie would later become Wyatt’s third wife, and he would spend the rest of his life with her. On October 25, 1881, Ike Clanton and Tom McLaury arrived in Tombstone. The following day, on October 26, 1881, they were arrested by Virgil Earp for carrying firearms within the city limits. After being disarmed and released they immediately sought their brothers Bill Clanton and Frank McLaury, and gathered on Fremont Street at a place called the O.K. Corral. Virgil, Wyatt and Morgan Earp and Doc Holliday all met their foes near the O.K. Corral and not at the famous location, as popular legend has it. Officer Virgil first called for their arrests, but when the cowboys refused, the shooting began and would last about 40 seconds. Although Morgan and Virgil sustained gunshot wounds, three of the Clanton brothers were not so lucky, as only Ike and another member of his gang escaped alive. When the smoke cleared Sheriff John Behan arrested the Earp brothers and Doc Holliday for the murder of Billy Clanton and the McLaury brothers. After a 30-day trial, the Earps and Doc Holliday were acquitted, as the judge concluded that they had been justified in their actions. On December 28, 1881, members of the Clanton gang sought their vengeance on Virgil. He would suffer “crippling injuries in the shotgun ambush,” according to the Tombstone Times. But attackers were able to kill Earp brother Morgan on March 18, 1882 while he was playing a game of pool. The assassin was not known, but Virgil and Wyatt thought Frank Stilwell was responsible. Wyatt killed Stilwell two days later. Behan obtained a warrant for Wyatt’s arrest on suspicion of murdering Stilwell. Wyatt took Josie and fled to Colorado. The two traveled through different mining camps and got married in Denver. In 1897, they followed the life of adventure to the Alaska Gold Rush. Wyatt and Josie returned to the continental United States in 1901 with about $80,000, and lived in Nevada and California. They later settled in Los Angeles, and Wyatt, the now-renowned gun fighter, served as a Hollywood consultant for westerns. He died in his bed on January 13, 1929 just weeks before his 81st birthday. Josie would live until 1944. George W. Parson, a mining speculator who knew the Earps, commented on Wyatt’s blood-drenched life of law and order: Wyatt “was not an angel, but his faults were minor ones and he never killed a man who did not richly deserve it,” according to the Tombstone Times. This article was originally written by Josh Katz; it was updated February 1, 2017.